President Trump and other GOP leaders have called for fundamental changes in the structure and financing of Medicaid along with repeal of the Affordable Care Act (ACA). The GOP has proposed transitioning Medicaid from its current structure that provides an entitlement to coverage and provides states guaranteed federal matching dollars with no pre-set limit to a block grant or per capita cap. A block grant would limit all federal Medicaid spending and per capita cap could limit federal funding per enrollee. To understand per capita cap proposals, it is helpful to understand variation in per enrollee spending and per enrollee spending growth across states and enrollment groups. A per capita cap policy could lock in historic variation. 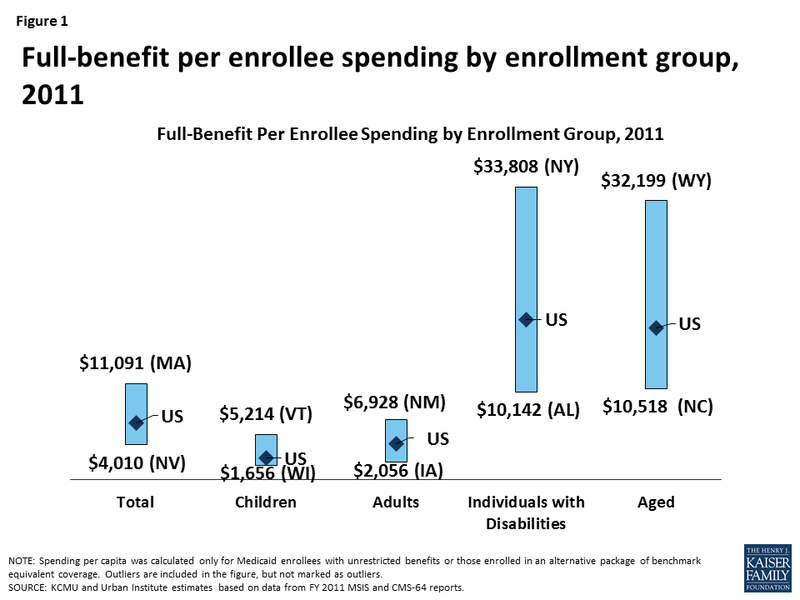 A more detailed analysis of per enrollee spending can be found in this brief. This data note uses interactive maps and tables to show variation in per enrollee spending and spending growth by state and eligibility group. Medicaid spending per full-benefit enrollee was $6,502 in 2011.1 Per enrollee spending is higher among the aged and individuals with disabilities due to the higher use of complex acute services and long-term care ($17,522 and $18,518 respectively for FY 2011). 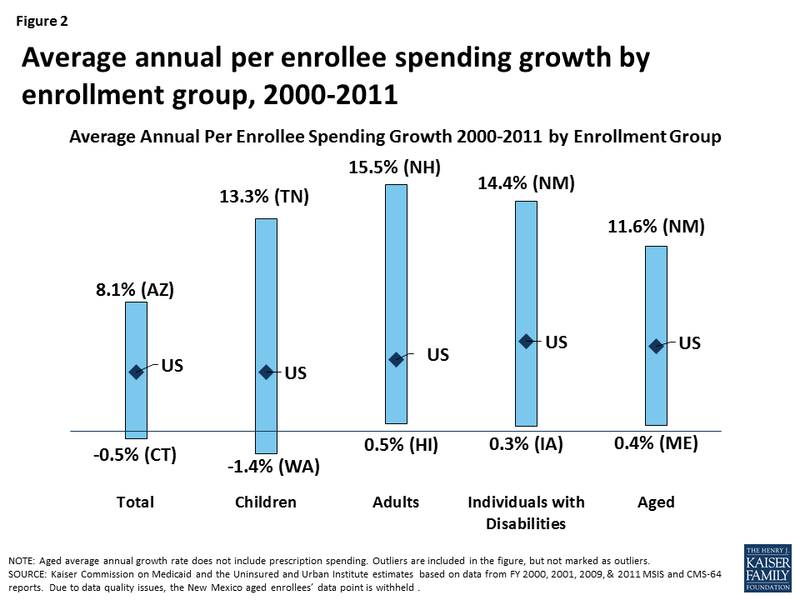 Average spending per Medicaid enrollee was less for adults and children ($4,141 and $2,492 respectively). For each eligibility group, there is considerable variation across states in per enrollee spending (Figure 1 and Map 1). In general, states in the south tend to have lower spending per enrollee, while states in the northeast have higher spending per enrollee. An additional table provides an index value to help understand how per enrollee amounts for each state compare to the national average. For example, spending for full-benefit enrollee ranges from $4,010 to $11,091 or 0.62 (62%) of the national average to 1.71 (171%) of the national average. Healthcare spending across payers consistently shows that a small group of high-spenders account for a large majority of the spending. Even within a specific eligibility group, spending varies considerably. We looked at states with average spending close to the national average, and found that spending varies widely within the eligibility group within the state. For example, average spending per disabled enrollee in Kansas is $17,153, but spending ranges from $765 for those in the first quartile to $126,727 for those in the top 5th percentile of spending. In Hawaii, spending ranges from an average of $5,439 for those in the first quartile to $57,130 for those in the top 5th percentile of spending. Despite the general lower cost for non-disabled adult and child enrollees, the variation in spending per adult or child was wide in both Ohio and Tennessee, respectively. NOTE: We selected states with spending per enrollee for the given eligibility group that was at or close to the national median. SOURCE: Kaiser Commission on Medicaid and the Uninsured and Urban Institute estimates based on data from FY 2011 MSIS and CMS-64 reports. NOTES: Because New Mexico MSIS data underreports spending for people in the CoLTS program, we are unable to report spending for the elderly in this state. However, we do include this spending in state and national spending per enrollee calculations. Due to data quality issues, individuals with disabilities in Maine who were enrolled in Medicaid only in Q4 are not included in state or national spending per enrollee calculations. SOURCE: Kaiser Commission on Medicaid and the Uninsured and Urban Institute estimates based on data from FY 2011 MSIS and CMS-64 reports. Because 2011 MSIS data were unavailable, 2010 MSIS & CMS-64 data were used for Florida, Kansas, Maine, Maryland, Montana, New Mexico, New Jersey, Oklahoma, Texas, and Utah. NOTES: Data represent the ratio of state per enrollee spending to the average per enrollee spending in the U.S. For example, spending for full-benefit enrollee ranges from $4,010 to $11,091 or 0.62 (62%) of the national average to 1.71 (171%) of the national average. Because New Mexico MSIS data underreports spending for people in the CoLTS program, we are unable to report spending for the elderly in this state. However, we do include this spending in state and national spending per enrollee calculations. Due to data quality issues, individuals with disabilities in Maine who were enrolled in Medicaid only in Q4 are not included in state or national spending per enrollee calculations. NOTES: Because of data quality issues in the New Mexico data, we were unable to report average annual growth in spending per enrollee for the aged excluding Rx. Due to data quality issues, we are unable to calculate spending per enrollee in Tennessee in FY 2000. Instead, we have calculated the average growth rate from FY 2001 to FY 2011 in this state. SOURCE: Kaiser Commission on Medicaid and the Uninsured and Urban Institute estimates based on data from FY 2000, 2001, 2010, & 2011 MSIS and CMS-64 reports. Because 2011 data were unavailable, 2010 MSIS & CMS-64 data were used for Florida, Kansas, Maine, Maryland, Montana, New Mexico, New Jersey, Oklahoma, Texas, and Utah. Eliminating partial-benefit enrollees (including those eligible for family planning services only or dual eligibles for whom Medicaid covers only Medicare premiums and cost sharing but not other Medicaid services) provides a better understanding of what Medicaid spends for people eligible for the full scope of benefits. Eliminating partial-benefit enrollees from the computation of per enrollee spending generally increases the calculations of per enrollee spending (because partial-benefit enrollees tend to be less expensive than full-benefit enrollees). This is particularly true for aged beneficiaries, as a large share of enrollees in this category are partial duals who have Medicare as their primary payer. Prescription drug spending for the elderly is excluded from growth rate calculations, including total growth rates. Beginning in FY 2006, Medicare began covering prescription drug spending through Part D. Consequently, spending per enrollee dually eligible for Medicare and Medicaid dropped between FY 2005 and FY 2006. This change in policy is important when using historic spending for projections into the future. However, the purpose of this analysis is to focus on the variation by state, rather than incorporating the effect of change in national policy. Medicaid’s Role: What’s at Stake Under a Block Grant or Per Capita Cap?